Globalization, according to experts is a social process that is due to the progress of time and can lead to positive or negative impact. According to the language of globalization consists of two phrases that is global and Sasi, a worldwide global meaning and sasi means the process. So it can be concluded that the notion of globalization is a process that follows the progress of the current date. Factors causing globalization generally come from various directions. But the main cause of globalization is increasingly rapid development era. This requires the development of time humans to adapt in order to survive in conditions era of increasingly advanced and modern. The impact of globalization we can feel in our daily life, ranging from the use of smartphones, the use of the Internet, the emergence of sophisticated cooking utensils, the discovery of electricity by solar power and so forth. 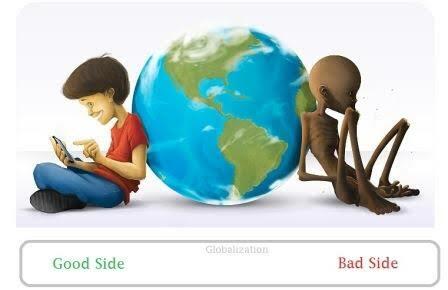 Basically, globalization can provide positive and negative effects, if examined more deeply. Basically, globalization has many meanings the notion of globalization in their own language, the notion of globalization, according to experts, and the notion of globalization in general. There are many causes of globalization of which is the development of time and human needs. Besides globalization also creates positive and negative effects, and these are materials about globalization work I have outlined. 1. Thomas L Friedman: Globalization is a combination of technological and ideological dimensions. Dimensions own ideology is the free market and capitalism, while the technological dimension is the use of information and technology that connects the world. 2. Emanuel Richter: Globalization is a global-scale network that brings together the world community in a bond mutual need of each other. 3. Malcolm Waters: Globalization is a social process that results in mind that the geographic restrictions in social and cultural terms become less important. 4. Achmad Supaman: Globalization is a process to make behavioral and objects characterize khusu an individual without being limited by geographic and regions. 5. Martin Albrown: Globalization is the process of connecting people all over the world into a single world community. 1. Sense of dependence of a country with other countries. 2. The development of democracy and government transparency. 4. The emergence of various agency is non-governmental and political institutions. 5. Development of mindset and community education. 1. The development of science and technology or science and technology. 2. The development of means of communication. 3. The emergence of a deal convening of the free market. 4. Increased functionality and role of international institutions. 5. The occurrence of modernization in various fields. 6. The development of applicable human rights. occurrence of globalization will create an impact on both the positive and negative. The potential impacts can not be avoided because it is concrete. 1. Increased discipline and a work ethic that is owned by the public. 2. Increased productivity of the people that will lead to a better life. 3. The use of technology is better than ever. 4. Progress in the field of Transporter, technology and communications. 5. Mobilas high due to increased transportation. 6. Increased development of a region. 7. Can disseminate culture through tourism. 8. Widespread market and increase state revenue. 1. The more effectively a foreign culture can enter Indonesia. 2. The faded sense of mutual cooperation which is owned by the public because it is always dependent on technology. 3. The occurrence of smuggling illegal goods into Indonesia. 4. The occurrence of social inequality. 5. Inhibit the growth in the industrial sector in the State. 6. The emergence of wasteful habits and likes burst wasting money. That material on globalization including the definition, causes and effects of globalization in Indonesia. Globalization is very important for the survival and simplify life. However, with the negative impact of globalization we are as a citizen to be introspective with the environment around us that are not affected by this negative impact. Thanks.